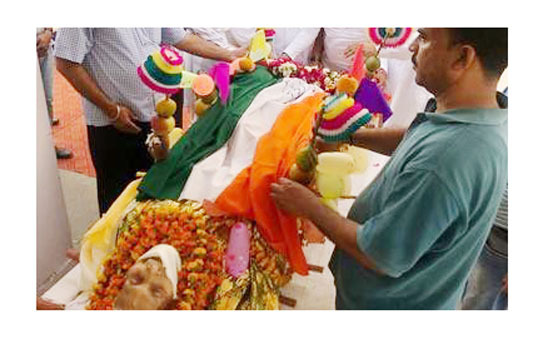 The former cooperative minister of Uttar Pradesh Chaudhary Samarpal Singh died after a long illness Friday afternoon. He was known as the Bhismpitamah of cooperative. He was 96. According to media reports, Singh was the Vice-Chairman of the fertilizer cooperative IFFCO in 1977 and had been honored with the IFFCO Sahakarita Ratna Award for the year 1995-96.He was also the Chairman of one of the cooperatives of Uttarakhand. Singh toured several countries to acquaint himself with cooperative institutions and suggest changes in the cooperative sector in India in the light of his foreign experiences. Singh was born on 19th December 1923. In 1963 his family settled in Kundeshwari, Uttarakhand. During 1988-89 he was appointed as the cooperative minister (Independent Charge) in the Uttar Pradesh Government. Social media were flooded with the condolence messages for the departed soul. IFFCO old hand and former Director of Cooperative Relation, Dr G N Saxena also wrote on his FB wall remembering the contributions of the departed soul.